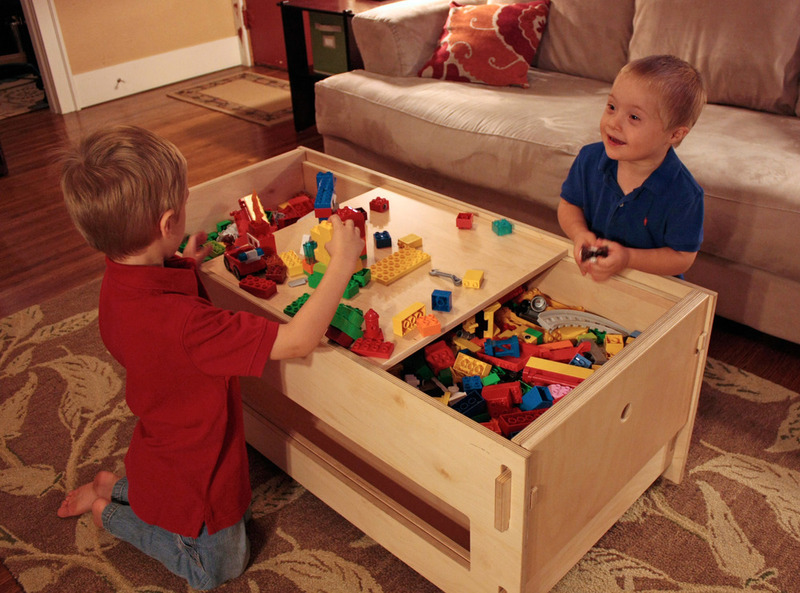 The Lego Storage Table is the first piece that we created, specifically for two little ones named Max and Charlie. It's a great piece of furniture for shared spaces, like the living room that's the play room by day and the family room by night. 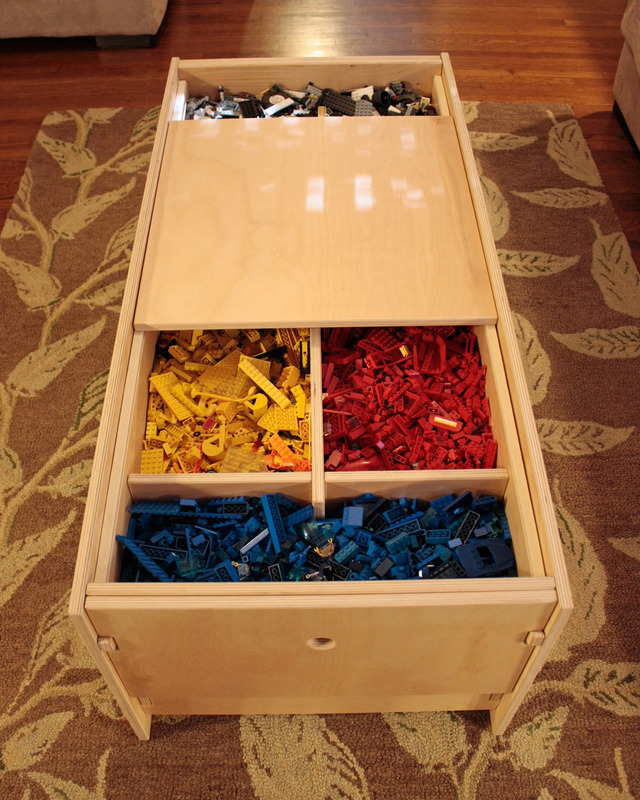 The Lego Storage Table is available in two configurations, one with and one without an extra lower shelf. The Lego Storage Table leaves room underneath to stretch out your legs, while the Lego Storage Table with Shelf gives you additional storage underneath for things like books and magazines. The table is made out of an incredibly strong and beautiful birch plywood that's covered with a tough clear melamine film, and all edges are smoothly rounded for safety. The 4.75" deep covered storage compartment has a solid bottom so that nothing falls through underneath. And there's a raised edge around the top to help keep small toys and loose Lego on the table and not your floor while your kids are playing. How much can it hold? Try 2.3 cubic feet of Lego. That's the equivalent of two full 5-gallon buckets or an entire plastic flip-top crate of building blocks. The two small cover panels lift out and store out-of-the-way on the ends of the table, allowing access to toys and building blocks. The large panel can also lift out, but it's designed to stay in place as the build platform, sliding end-to-end on felt-lined rails to let the kids reach all of the compartment below. The Lego Storage Table includes a set of dividers that you can optionally drop into place and slide around to help organize your building blocks. And like all the other klevr pieces, it assembles without tools in no time at all. It slots and snaps together smoothly and solidly using Klevr's patented assembly method without any friction-fit joints or hammering required. The Lego Storage Table has a solid bottom in the storage compartment. It includes a drop-in divider that splits the storage compartment into four rectangular volumes. 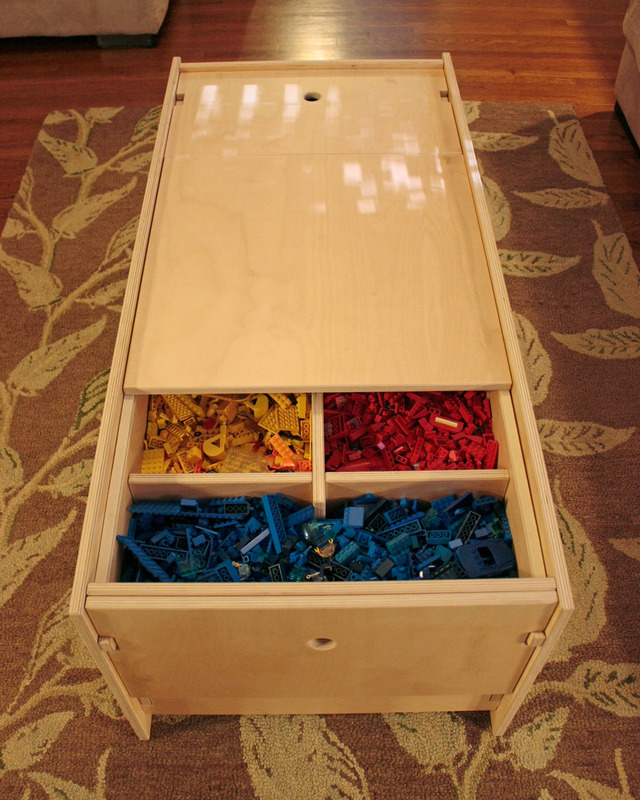 The Lego Storage Table with Shelf has a solid bottom in the storage compartment. It includes a drop-in divider that splits the storage compartment into four equal volumes.